There are days. No. There are weeks. No. There are YEARS, when you can feel like you just don’t fit in. Period. It is such an insecure place to feel like you just don’t belong anywhere. I think we all feel that way time to time. There are tragedies that can completely change the landscape of your life, and make you feel lost in a place that used to be wonderfully familiar. I have had some events in my life that have left me unsettled and uprooted, and feeling like I was a random misplaced piece of some random 500 piece puzzle, in some random dusty attic. You do not choose to feel that way; it literally just happens. 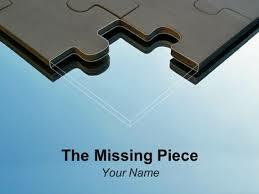 Today it hit me that I am NOT a misplaced piece of a puzzle. I am a MISSING piece. And not missing from some random puzzle. There is a 500 piece puzzle out there missing just one piece to complete it. Yup, that’d be ME. Somewhere I fit and no one else can fill that spot but me.